Do You Know that you can search just the 250 pages of Church Records and Histories on the site by using the Churches button in the Partitioned search engine at the bottom of the Current What's New Page? . Formation of Caton Church—Three Days’ Meetings; Views as to their Errors and Benefits—Labors as an Evangelist, Chiefly in New York State—A Variety of Revival Incidents and Peculiarities—Chemung River Association—Protracted Efforts in Caton—Trumansburg—Steuben County: Hunting Foxes up at Babcock’s: Backslider Reclaimed—Howard Flats: the Universalist Preacher, Struck Dumb: a Pentecostal Deacon, Confounded: Gunpowder Plot—Seneca Falls: Old Ship Zion—Big Flats: Roads Blockaded with Gates, and the Guilt Confessed: the Young Horse Racer and Gambler—Yates County: the Wicked Valley: Happy Change: Disturber Silenced—Crooked Lake—The Agricultural Sermon: the Card Player—Political Alienations: an Offended Member Prays Against his own Church: Another Confesses his Annoying Partizan Songs—A Church Opposes its Pastor as to a Protracted Meeting, but Relents, and is Blessed—Rochester Meetings—How a Sign-Post was Torn Down—Personal Appeals, or Individual Efforts—Singing in Open Meetings. Having retired from my field in Pennsylvania in a great measure, I was next on the look-out for some other destitute place on the Southern tier of counties in York State. I was conversing with a brother, in the town of Hornby, who tried to preach a little himself. He informed me that, in a remote settlement in what was then called "Number One," now known as the town of Caton, in the south-east corner of Steuben county, there were a few brethren and sisters who had moved in some years before. Remembering the day of the covenant meeting of the church from whence they came, they met together, the same day, for conversation on the dealings of God with them. There were but few Christians in the settlement, the major part of the people being unconverted. He entreated me to go and see them, for it was a very rare thing for a minister to pass through that place. If I would promise to go, he would go with me. I could not state the time, but he said, when you get ready to come this way, call on me, and we will go over and see how they do. The first opportunity I had, I called on him, and said, "Can you go to ‘Number One?’"—"Yes," he said, "do you want to go to-day?" I replied, "Yes, if we can get there in time to circulate an appointment for the evening." He said, he thought we could. We were both well mounted, but the day wore away so fast that I was afraid we should not be able to get many out. He said, "We can expect only a handfull of people." I remarked to him, "If we do anything, we must make a fuss about it." As we entered the settlement, he said, "We will stop here." The day was very cold, and we both needed a stopping place. We inquired for the man and woman, or the heads of the family? They were not at home. There were some stout, lusty-looking young men, and one or two of the daughters who were well able to set the table. I began to talk about the state of religion, when one of the young men turned around to me and said, "We never have any preaching here, scarcely, and I don’t care much whether we ever have any more such preaching as we have had, or not." I asked him if he was a professor of religion? He said he was. I told him I was glad of it, for I was a Baptist minister, and wanted to preach. He replied, "I don’t think we shall care about hearing you. We have been taken in, here, too much, by strangers." I remarked to him that there must not be much time lost in getting out the appointment. "I shall preach, sir, and I shall not notify the people myself." He said, "I should like to see your credentials." I told him my credentials he had no business with. "You are acquainted with the brother who is with me, and by him you have been sending invitations for me to come over and preach. I am come, and there is no time to be lost, parleying about credentials. And now sir, I want you to start, and start speedily; and I want you should run, not walk, but run from house to house, just as fast as you can and tell them that Eld. Sheardown is going to preach, tonight, at the Miller school-house. Now, don’t you delay, sir. "—"But I have not time," he said. "It makes no difference to me, sir, whether you have time or not. You have got to do as I tell you; and now, make all speed, and just give the notice; do not stop a moment at any house to talk, but do up the work effectually." I finally got him started. And he went like a rolling ball before the wind. He called at a certain house, and said there would be preaching that evening at the school-house. The lady said, "Stop! I want to know by whom. "—"I don’t know," said he, "he is the queerest fellow I ever saw. He almost swore that he would preach. "—"Is it alone?" was the inquiry. "No, Bro. W. is with him"—"Well, then, it is Eld. Sheardown. "—"I don’t know, it is Shear-something; but I must not stop, or he’ll be after me, as no fellow before ever was after me." He did the work faithfully, excited every individual he saw, and himself was a perfect eccentric. Perhaps no person who got the word, failed to be at the meeting that evening. My text was, "And thou hast well done that thou art come." That night was the entering wedge, that opened the way for my going again. I was solicited to go and preach three or four days, or as long as I could. They said the people would drop everything, and attend meeting, any time when I could make it convenient to come. I sent them word at what time I would be there. The appointment was made, and the few Christians were ready to go to work. We had a blessed season. Several choice spirits were converted to God. It was remarked, by many, that there were not more than two or three men in the settlement who were not converted, or under pungent conviction, and those few were scoffers. One, especially, would tantalize the pious by saying, "O yes, you have a great deal of feeling, now, for us sinners; but, as soon as Sheardown is out of the place, there will be no more praying for sinners." Something like a year or more after this, one of my good deacons was with me as we passed through that settlement, and I preached over night, ready to depart early in the morning. We started not far from sunrise. There was a little snow on the ground, the morning cold and chilly. Our course lay through a long strip of woods, on a road very seldom traveled. I saw some men coming towards us, and said to Deacon Overhiser, my companion, "There, I believe, come some of the Number One brethren," and surely they were. We stopped and talked a few moments. I got out of my saddle and hitched my horse to a little sapling. The brother inquired, "What are you going at, Elder? "—"I am going to have a prayer meeting there in the woods." I was very desirous to know whether those young brethren kept their mouths open for God, and it appears to me to be a very good time, for my own soul needed a morning baptism. There was a very inviting spot, a fallen tree, lying close by us. "Now," I said, "we will all kneel, here together, for a precious season in praying. I will lead the circle, and then the rest of you follow on. We will all pray." After I had prayed, and the brother who was with me, I thought I heard the stepping of a horse pretty close by me. The thought flashed over my mind that one of our horses must have got loose. I looked up, and to my utter astonishment there was a man and horse standing still. The man had dismounted, and held his hat in his hand. I have seldom heard more fervent prayer put up for the unconverted sinners in the settlement, than had been lifted that morning, and by those brethren. When I rose from my knees, I at once recognized the man. I took hold of his hand, and said to him, "Now, sir, I hope you are convinced that praying for sinners, by Christians in Number One, did not cease when Sheardown left." He was pale as ashes, and trembled like a leaf in the autumn breeze. I have never learned whether he was converted after this, or not; we parted, and each went his own way. There were some peculiarities about the meetings held in that settlement. We worked all day for God. Our prayer meetings commenced at five o’clock in the morning, no matter how dark or stormy. Some would bring their day’s provisions with them; others would scatter to the nearest neighbors, and, (with the exception of two or three short recesses,) we would continue until nine o’clock at night. No wonder, in my mind, that God should bless such a people. They were soon organized into a church, and erected a comfortable meeting house. Like all other churches, they have waxed and waned, but, by the grace of God, they continue to this day. There is one circumstance connected with that revival, worthy of notice. I stopped at the house of a Bro. Woolcot, near by the place of worship. A number had stayed there through the night. He had plenty of provisions, and, as it regarded the lodging, it made but little difference, for the soft side of a pine board was good enough for any of us. Among the guests, one night, was a female who hoped in the mercies of God, but whose husband was a very wicked man. She lived three or four miles from the place of meeting, and wanted he should let her have a horse to ride, but he refused, and was pretty abusive with his tongue. She had a baby some six or eight months old. She told him she should go to meeting, if she had to walk and carry her baby, which she did. I arose, as usual, in the morning, about five o’clock, to go to the prayer-meeting, and in passing the barn of my host (which stood close by the way-side) thought I heard a singular noise. It was raining hard, and had been all night. I listened a moment to hear from whence the sound came, and found it was some person praying in the stable; it was a female’s voice, and evidently in a great struggle of soul; the subject was her husband, and that God might so control him as to bring him to the meeting. My heart was stirred; I believed that God would hear her prayer; but at the time I did not know who she was. It came out in the meeting that it was the dear sister whose husband would not provide a way for her to attend. From report, he was a profane, wicked man. We had not been in meeting half an hour, before he came in—a large, heavy Dutchman, thoroughly drenched with rain. Before he had got to the middle of the school-house, perhaps he meant to kneel down, but he came down in our midst like an ox from the felling axe. He told us he had started, over-night, to come to meeting, and had been in the woods, and in the fields, and all over, almost, except where he ought to have been. His own remark was, that he had been "lost all night;" and how he found the place of meeting, he could not tell. The first thing that he appeared fully to realize, was, that he was a penitent, confessing sinner. He professed, in the course of that little meeting, to have a hope in the Gospel of Jesus Christ, which I trust he had. Had now become very common in the churches. In 1830, I received the first invitation to attend a three days’ meeting with the church in Trumansburg. We held services the appointed time, but were under the necessity of stopping, because our time (which was limited to three days) had expired. It was customary, when such meetings were held, to invite ministers and brethren, from neighboring churches to come in and help; consequently it made, in show, a great work, and many indeed were the happy recipients of Divine grace in those three days gatherings. But, no matter how deep the work of grace appeared to be, we must dismiss at the close of our appointed time. There was a strange infatuation among many of the brethren relative to doing God’s work, and some even thought it was presumptuous to have such meetings. I have often closed labors, when my inmost heart was grieved. We could see God so willing to work by his people, and ready to save; then why should the work cease? But extra labor for the salvation of sinners was then in its infancy, and God must have praise that the eyes of the church were opening to the great duty of being workers together with him, let the time of special labor be longer or shorter. I had well learned that the Gospel was the only power of God unto salvation, and, believing this, I saw the necessity of a more continuous bringing in contact the sinner and the Gospel. And holding, as I do, that all the power is of the eternal Spirit, in order to be the recipients of that power the church must learn to let go everything else, and labor in holy consecration and dedication to God, with an unshaken faith in His promises. Divine efficiency and human agency thus united together, will produce the desired end. I have lived to learn this fact, that, while without God we can do nothing, nevertheless, it is essential for us to do our duty, as it is for the farmer to till his ground and sow his seed, to be enabled to gather a harvest. I also learned that it was not the best way for the church to gather in a great deal of aid from abroad, because it appeared to divert the minds of the public, as well as the church, from the great, important responsibility that rested upon each one. They were continually finding fault with this sermon, or the other sermon; one liked this preacher, and the other liked that; and it was indeed as in the days of the Apostles, some for Paul, some for Apollos, and some for Cephas. It created in the churches, as well as in the congregations, a kind of "itching ear." Some good ministers would be put very low, while others, who appeared to have greater gifts for talking, were valued just in proportion to the volume of their voice, and the multiplicity of their large words, though the greater part of what they said would perhaps have little or nothing more to do with the salvation of the souls of men, than the chattering of the crane has to do with the music of heaven. Hence, by degrees, it was found that the better way was for the pastor of the church, and one brother from abroad, to do the greater part of the preaching; it produced a better effect, and left a more abiding influence, than was attainable from all the foreign aid that could be brought in. It was necessary, at times, for some churches, that were in a very low state, to invite some good, Holy Ghost, praying brethren, and sisters, from the churches in the vicinity, to labor with them. But, as it regarded the preaching, after the novelty of the speaker had passed away, (which generally would in the course of a few sermons,) then the church and congregation would settle down calmly and dispassionately to listen to the truth that should be advanced. It is a palpable fact that these special meetings did not always produce the desired good. And a variety of causes, in all probability, led to the failure. I think, for one, that the fault has been either in the churches, or in the evangelists: for, whatever passes through human hands, will be in a greater of lesser degree be defective. While god works by agency, that agency must of necessity be of God’s appointing. Wicked and designing men, perhaps, have sometimes palmed themselves off upon the churches; and on the other hand, churches have sometimes sought for men who were capable of getting up the greatest excitement. I believe that no individual was ever converted to God without being excited; yet there is such a thing as genuine excitement, and also superficial excitement. Some seem to think, if they can only have "the whirlwind and the fire," it is all that is necessary; but this whirlwind and fire do not appear always to be the means that God blesses to the salvation of sinners. Genuine excitement, I suppose, is occasioned by the truth of God operating upon the hearts of the children of men. Hence, the Gospel becomes the power of God unto salvation to them that believe. The effort to bring men to God, very often, fails, because there is more trust and confidence put in THE MEANS, than FAITH IN THE GOD OF THE MEANS; and the result will be, in every case, that more or less superficial professors, or unconverted people, will be brought into churches. I remember, on one occasion, stopping in a village for the night, where there was a protracted effort going on. I was invited to preach, but declined, on the ground that I did not know the state of the meeting, neither did I know the class of Gospel truths that had been presented to the people. I tarried and heard the sermon, and think I was a prayerful observer of the modus operandi as it passed before me. I felt, under the sermon, as though I was standing close behind Moses when God spake from his burning pulpit on Sinai’s trembling mount. The effort appeared to be carried onward without one ray of hope to illumine the dark, obscure winding to the very mouth of the fearful pit of long despair. No Jesus appeared, no invitation given, no up-lifted cross, no running blood to quench the fearful flame, or waters of life to cool the thirsty tongue! I anxiously looked for the result, for I felt under a hardening process. I could not see, in saint or sinner, any marks of deep contrition, nor any livening up of the consciences of God’s professed children. When the sermon was closed, the anxious were called forward—all very well in itself, providing that they had been really anxious for the salvation of their souls. Some few cold, stereotyped prayers, were offered, and the anxious were requested to rise, after which the leading spirit of the meeting said to those inquirers, "Now we are going to sing a verse, and all you who are willing to give your hearts to God, when we come to the clause, ‘Here, Lord, I give myself away.’, bow your heads." Several of the anxious complied, and as soon as this was done the individual said, "Remain on your feet until I count you." His eye ran over them, and he then announced to the congregation, "So many more converted—so many more have given their hearts to God—so many more delivered from the power of Satan." I had but one ejaculatory prayer to offer, and that was, "From such awful deception, good Lord, deliver us." There has probably been too much desire, in the hearts of many professed evangelists, to aim at numbers, so that, at the summing up of a few weeks’ labor, it might look like a great work. And such individuals were sure to say, before they left the field, privately to some friends, "Now, just pass this through the papers, if you please, so that the churches may see, for their encouragement, what a great work of grace has been done amongst you," when in fact it was too evident, in a very short time after the close, that there had been but very little if any work of grace at all. Notwithstanding there has been a good deal of chaff among the wheat, nevertheless I believe, in my inmost heart, extra efforts, when rightly put forth, have resulted and must result in the salvation of immortal souls. Yet, in order for this, the truth as it is in Jesus must be proclaimed, attended by the demonstration of the Holy Ghost and power, and that will bring about this greatly desired end. Sometimes a church will send for an evangelist, in order that they may have what they call a good time. They will pray, sing, and talk, with a great deal of emphasis, but they do not appear to possess that peculiar state of mind which is necessary, I think, in the first place, to take away from the church all human dependence, just as much as it is to endeavor to take away the sinner’s dependence, or that in which he trusts. I have never known it fail, in all my observation, that, whenever a church of Jesus Christ, under the proclamation of God’s precious truth, was brought down at the feet of sovereign mercy, and was led to cry out, as did Rachel of old, "Give me children or I die"—I have always noticed, that, under those dying pangs and labors of soul, sinners have been converted to God, and Zion has been increased by an addition of living members. I have before my mind’s eye, a circumstance which may be worthy of narration, to show the importance of church harmony in working for the salvation of sinners. I was called, by a church in Steuben county, to hold a protracted meeting with them, and entered into an engagement to be there on a certain day, some weeks in the future. When the appointed time had come, I was travelling along to the place where I had been directed to stop, and had to pass the meeting house. Seeing horses, wagons, and everything to indicate that there was a gathering inside, I concluded to stop and see what was going on. I found it a prayer and conference meeting, appointed in order to have everything in a state of readiness to proceed with the work. After the little excitement of recognition was over, I requested them to proceed with their meeting. They sang beautifully, prayed loudly, talked freely, and appeared to be filled with joy and rejoicing. One of the deacons remarked to me, "Now, Elder, we are all ready to go to work. I do not think you ever met with such a church in your life. We are all right. "—"You have told the truth, my brother," was the answer, "for it has never been my lot to meet with or see the church yet that was all right, just as God would have them." The reply was, "Well, sir, you will find that you have nothing to do but to go to preaching, and souls will be converted right away." Instead of this encouraging and quickening my faith, it had quite the opposite effect. But I gave out appointments for the next day. We commenced with a prayer meeting at nine o’clock in the morning, preaching three times a day, &c. I tried to preach as best I could, but my words appeared to be like the chattering of the crane or swallow. The unconverted came in, and filled the house to its utmost capacity; there was evidently a great deal of conviction amongst them; but not the first sign of any coming into the kingdom of Christ. I was conscious where the difficulty lay, and came to the conclusion that it was necessary to press home upon the church the truth of God in order to break that pleasing monotony of religious service that they appeared to be possessed of. I still found that they traveled the same round, like the blind horse grinding at the mill. After making a new consecration to God, and pleading for special aid, I concluded to preach a sermon to them of such a character as (I hoped) would tell in bringing them into the path of moral labor. After it was through, I remarked, "Now, brethren, I want you to go to Dea. Babcock’s upper room, tonight, every one of you, and we will go to hunting foxes. I think we shall find some, either small or big." Some of the leading brethren appeared to be very much put out in consequence of so much being said about Christians before the unconverted, and manifested a great unwillingness to go to the place designated; they appeared to be parleying upon the subject. I remarked to them, "You can do as you please, brethren; go to Babcock’s, or let this be my farewell sermon with you. Suit yourselves." My dear Bro. A. C. Mallory was then spending some time with me, with the expectation of coming into the ministry. After we had got seated in the upper room, the brethren declared themselves aggrieved, and wished that I had never come; they thought there was more harm done, already, than all the good could counterbalance that might be done, if the meetings should continue. Bro. Mallory arose, with his large heart and big tears, and said to them, "Do not be so hard, my brethren. Eld. Sheardown is a man of a great deal of experience and observation. I know him of old. He either sees or feels something that has led him to take the course he has." After his remarks, one of the brethren arose and said, "Now, do not make strange of this thing, brethren; you know, as well as I do, that there is difficulty among us. You know that I have not come to the communion in a very long time, and you also know that I very seldom meet with you on any occasion; and you know the reason why. I am not sure," he continued, "that this is the proper place to talk this business over, but I have carried it as long as I can." I remarked to him, "Bro. S., this is the very place and time. This work must be done before God can consistently bless." "Shall I tell it, then," said he, "just as it is?" I replied, "Yes, tell it, just as it is; untie the bag, and let all the cats out here in our midst; then we will try and take care of them." This offended brother was a business man, and it was one of those hard seasons or crises in monetary affairs, of which he felt the pressure. The difficulty with the church, as then stated, was, that the various pastors they had had, for some years previous to this, were requested, if they thought proper, to do their trading with Bro. S., who was encouraged, that, if he would wait upon the pastor, they (the brethren) would take in their wool and corn and cancel the debt at the expiration of the year. This they had failed to do, year after year, until the brother became jaded in his feelings, and pressed in a pecuniary way, so that he was sore from head to foot. He was replied to by some of the brethren, that "we can not do it now; it is no time to talk up such things in a protracted meeting, and we have not come out prepared to meet anything of the kind." I remarked that it could as well be done then as ever, and asked the brother if he could give the amount due him. He said he could, and stated the sum total. I recommended that it should be raised on the spot, and wished them to take their own course to do it. They tried by subscription. One dear brother, broken down in his feelings, and subdued in his spirit, said, "Brethren, I do not feel able to do a great deal, but I am very anxious to get this whole thing out of the way. I will give fifty dollars, notwithstanding the long continued sickness of my wife, which, you all know, has been a great bill of expense to me." But, having failed in the subscription; "equality" was then talked up; and, by equality or assessment and subscription both, I believe, the amount was raised. The next point was, when shall it be paid? I remarked, "It can as well be paid tonight, as any other time." The plea was they were unprepared, and it would require a little time to get the funds together to cancel the debt. I answered, "I know that, and perhaps one word from Bro. S., will decide the point at once." The question was put, "Are you willing, my brother, to take the obligation of these brethren, thirty days after date?" He said, "Yes. "—"Now, then, for pen, ink and paper; let those due-bills be drawn, and signed, here, to-night, and put in the hands of our grieved brother." All was done up. The church appeared to be humbled, and the brother satisfied. I then remarked something like this; " Now, my dear brethren, if there are any more foxes that might spoil the vines, do let us have sight of them, to-night, that we may not be at the trouble of digging them out of their holes." One other domestic difficulty was also settled by the church thus assembled. They felt they were chastised, appeared to bear it meekly, and said they believed there was nothing else of moment among them. I remarked, "Now, brethren, if your ways please God, He will give us an evidence of it on the coming day, if we live. But what shall we expect as an evidence that all is right? There are a great many sinners in this place, under the most pungent convictions. Now, to-morrow morning, after sermon—for I do not wish to make any extra effort to bring about the end I have in view, but we will take this as an evidence that our ways please God—I will say to the great congregation, "Is there any individual here, who last night went from this house loaded down under a sense of a guilty conscience, as a sinner against God, and feeling mercy upon him or her? Now, if there is one such present, who feels this morning that God has put away his or her sins, and who enjoys a comfortable hope in His pardoning mercy—rise on your feet." When the invitation was given, five individuals, I believe, arose in different parts of the congregation. The Saviour had set the captive exiles free, and had put a new song into their mouths. That was the beginning of one of the choicest seasons that perhaps I had ever experienced in protracted effort. The pastor of the church was a young man, not yet out of his studies at Hamilton; consequently, it fell to me to baptize the candidates. I think, as the avails of the labor of that dear church, in connection with the young man, and my unworthy self, I was permitted to baptize ninety-nine. A Presbyterian brother told me that he had devoted a great deal of time to riding through the community, and was perfectly acquainted for several miles around; he thought, from his calls, and personal conversation, in the meetings and out of the, that there could not have been less than near four hundred souls hopefully converted to God. They came from eight to ten miles distant, with their double teams, bringing in from ten to sixteen in each wagon, bivouacing for the day, going home at night only to return early the next morning. And I believe, to this day, it is a common proverb in that region, if there is any difficulty, in a family, church, or neighborhood, that they "ought to go to Babcock’s." An item in relation to an excluded member of that church, and I shall leave it. He had adopted fatalism as the foundation stone of his creed—"that if a man was to be saved, he would be saved; and if he was decreed to be lost, he would be lost." He stated to the congregation, that, when he heard of the meetings, he made up his mind to attend every one in his power, and see how the machinery worked. "The first move," he said, "did not stir me, for I saw that those who were professing to be converted, were all young people, perhaps in their teens. The Elder said, (he remarked) "’Brethren, you see that God hears your prayer; that He is willing to bless; now let your faith rest upon the promises of God, and you shall see greater things than these.’" He continued, "I watched with a great deal of interest for greater things. By and by, another class of people appeared to be coming in, but they were a class who I did not think were over-smart. Then the Elder jumped up again and said, ‘Now, brethren, hold on upon the promised of God; keep very low at the Saviour’s feet; talk but very little; pray a great deal, in your families, in your closets; nay, let your every breath be the breath of prayer; and you shall see greater things than you have seen.’ I said to myself," he continued, "now you think you have done wonders. But I should like to see you take such men as Esquire P., our Supervisor, and that class of people. Then I will begin to think there is something to it. If I can see them come forward and act in this thing, I shall believe it is of God, because I believe they are honest men, and they wont be drawn in by the shallow opinions that have induce those others to come. To my utter astonishment," said the old man, "the first thing I knew, behold there were Esquire P. and his wife, weeping, upon the anxious seat. I said to myself, I am now taken in my own traps, but I will wait and see how they come out. Very soon, they were converted. I can not gainsay their conversion. I used to think that I knew the power of religion upon the heart." At this point, the gentleman became bathed in tears, and again he continued: "The next individuals I noticed, were Mr. Beach, and some others whom I had singled out as men who knew too much to be induced to make a profession of religion without experiencing its power. The controversy between myself and God’s work had to be given up. I hope, my brethren, I shall never live to get into that awful state of darkness and opposition to the works of the Lord again, for God is certainly in this place and I knew it not. While Eld. D. M. Root was pastor of the church at Howard Flats, he was very anxious to have some ministerial aid, and I endeavored to assist him. It was another very sterile place in the great field, and appeared to be almost impervious to the Gospel of our Lord Jesus Christ. We opened the meeting, not knowing when or how we should close, for God has never permitted us to look into the future, or judge from the outward circumstances. I expected that the powers of darkness would come up in solid phalanx against the little host of God’s elect. We very soon had a house filled to its utmost capacity, and the people listened to the truth with as much decorum as could be expected. The time passed along—brethren and sisters prayed, and, as usual, not very much affected by the scenes that were passing before them. One individual always remarked in his prayer, "O, Lord! Give us a pentecostal season—let us see things as they were on the day of pentecost!" I said to him, one day, "Do you believe, my brother, that God will answer your prayer?" He hoped so, he said, or he would not pray. I continued, "Now, Deacon, if the Lord should be pleased to give us but a small portion of the Spirit that was poured out on that occasion, I am afraid you might find yourself unprepared to receive it." The dear man felt rather touched by the remark, though I endeavored to make it as free as I could, that he might not think that we were doubting his piety or honesty; for I was well aware, if God should shake the heavens and the earth, there should be a terrible outcry when the adversaries of Zion should lay weltering in their moral blood. I remarked, one day, to the congregation. "We have preached to you the twenty-seventh sermon, all bearing upon your duty to God, and the fullness of salvation to those who repent and believe; but you are yet unmoved. Now, on such an evening, (which I think was Thursday of the same week,) I shall tell you the worst of it." On our way to the church, at the time indicated, some individuals fell in with us in the street, and one politely said, "Are you going to church, brethren?" One of our brethren replied, "Yes sir." I looked up into their faces (for I had paid but little attention to them previous to the remark,) and saw one of them was a Universalist minister. I said, "How do you do, sir?" He said, "Very well. How is Eld. Sheardown? "—"Very well, sir. "—"What meeting have you at this hour, sir? "—"Prayer-meeting, sir, previous to the evening services. "—"What time do your evening services commence?" He was told the preaching would commence about half-past six. He remarked that he was glad to have an opportunity to go to church. We went on together. I opened the meeting; he sang beautifully, but did not appear to have any praying to do. The prayer and conference meeting having closed, I opened the more public services. My text on that occasion, (for I was to redeem the pledge that had been given—to tell them the worst of it) was from a part of one of the Saviour’s parable: "The rich man also died, and was buried; and in hell he lifted up his eyes, being in torment." As soon as I read my text, the Universalist drew from his pocket or bosom quite a large piece of paper, and commenced taking notes. He wrote, probably as fast as he could, through the whole sermon. I was somewhat acquainted with the way in which the Devil very often undertook to dissipate the truth of God, by getting up an argument, if possible, on the subject of salvation. When I closed my sermon, I was led to deviate some from my common course, and felt as though a season of prayer would be the best thing for us under the circumstances. An invitation was then given for some brethren to kneel at the breast-work at the foot of the pulpit, and pray for the anxious or inquiring sinners. Probably eight or nine bowed down, and one brother led on in fervent supplication for the unconverted. The brother next to him was Thomas Clark, who was looking forward to the ministry, (and, some time after, was ordained.) With other language, he uttered in his prayer something like this: "O, Lord God! Here is a wicked man, an infidel, I believe, who has been taking a schedule of the minister’s sermon. If he shall rise to-night to endeavor to explain away the truth of God, when he shall look upon that schedule let him be struck with blindness." About this time, the Universalist came out of his sea, which was very near the praying group, with his paper in his hand. "O Lord," Bro. Clark continued, "if this man shall undertake to speak in order to cast dark shades over the truth of God, let him be struck dumb. O Lord; if he shall go into the Academy, next Sunday, to his appointments, and undertake to deceive immortal souls and lead them down to destruction, let him go swift down into the pit! But now, dear Lord, if there is a drop of mercy in the bowels of heaven for such a wicked sinner, may he repent of his sins, to-night, and God have mercy upon him!" I think I never felt more of the power of the Spirit of God under prayer, than I did while this dear brother was pleading with the Almighty. His prayer was lengthy, but full of the Holy Ghost and faith. Fearfulness and trembling appeared to take hold upon the congregation. When he said "Amen," they all arose from their knees, as though the mutual conclusion was that there was no more praying to be done at that time. The Universalist retired, after prayer, to his seat, paper in hand. The next remark was, "Now, if there is a convert, or any dear brother or sister, who feels as though he or she had a word of exhortation, speak on." He came out of his seat, put himself in a speaking attitude at the foot of the pulpit—we were all looking, eyes and ears open, to see and hear what was coming—but not a word was said: he returned to his seat. One or two brethren spoke a few words. He came out the second time, and all eyes were upon him, waiting for what he had to say: but he said nothing, and returned. After another short season of conversation, he went through the same maneuver; and as he turned to go away for the third time, I brought my hands together and exclaimed, "God be praised! My brother’s prayer has been heard in heaven, and answered. The infidel is struck dumb!" He took his hat, then left the meeting. That was the last time I ever saw him. I have heard, since, that he was converted under the labors of Bro. Marsena Stone. If so, indeed he is a brand plucked from the burning. I do not know that I have any reason to doubt it. Still I have thought a great deal of a remark made by an aged brother who lived in the same place where he had lived. When I was relating the circumstance to him, he said, "I think, if he is converted, he had better come back on the ground where he has done so much evil. To me, it would have been far better than to go to the West." After this, things went on in peace for a few days. Our meeting-house was badly contrived. It was warmed by a large stove, which would admit wood perhaps three feet long, and stood directly in front of the pulpit. Consequently, when the house was full, it was necessary to let the fire go down until after sermon. The sexton (who was also a good deacon) managed the fire as best he could. I saw, one evening, he had not put in the wood—I thought at all events, I saw the brick that closed the draft of the stove was not removed as usual. I spoke to the deacon, from the pulpit, in a low voice, saying, "Remove the draft; they are cold in the back part of the house." He came to me and said, "I dare not remove the brick, sir. I have been informed that there is somebody here who calculated to throw gunpowder into the stove." I said, "O no, such a man would be a bigger fool than Nabal." He removed the brick, and all went on right. Next Sabbath morning, I went to church very early. Every person who has known me through life, knows that I am always among the first at the house of God. There was no one there but the sexton. He had on a very heavy fire. I said to him, "Deacon, you are warming things up this morning." He replied, "Yes, I came very early, on purpose, for I am aware that the people who come in from a distance will be very cold." We had been out of wood, and I had said, several days previous, to the congregation, "We want wood, the sexton says, and we will omit services this afternoon, and try and get some wood. We will make a wood-bee. I will go also." A brother remarked, "I don’t know how we can get to the wood. It will take most all the afternoon to open the way through the drifts." I said, "There are a number of dry hemlock trees, standing not far off on a knoll, there in the field. I wish I knew who owned the, I would see if he would not let us have them to supply the church." A man arose and said, "Some of them are mine, sir. You are welcome to all you want. You may cut them down, and take the bark off. There is a green maple you may have, and the bark and the green maple will make very hot fires." I thanked him for his kindness, and told him we would accept his proposition. We had been burning this fuel some days previous to the Sabbath morning that I was praising the deacon for having such a good fire. He said, "Now I will go and fetch my wood, ready to put in the stove after sermon. When he came in with the second armful of wood, which was laid down near the stove, I was musing, and looking at him piling it up. There was one stick that caught my eye. I said to him, "Deacon, where did you get that stick of wood?" He replied, "In the wood shed." I said to him, "That is not our wood." "I see it is not, sir," he said. "How came it there?" "I don’t know," he replied. "Now, sir, there is something wrong. My impression is that there is a charge of gunpowder in that stick." His answer was, "O, no, I think not. It is a stick that has been used for something, and has had a pin driven through it." I said, "Hand it here; let me look at it." It was the quarter of a very good sized white beach, that looked as though it might have been cut and seasoned a year. The pin had been cut off with an axe, in doing which they had lightly glazed the stick, which showed that it was a very recent work. I said, "Lay that stick in the pulpit; I shall preach about it, to-day." He laid it in the pulpit, under the injunction that he should tell no man. I had for the text, that morning, Zech., 4th chapter, and 7th verse: "Who art thou, O great mountain? Before Zerubbabel, thou shalt become a plain; and he shall bring forth the headstone thereof, with shoutings, crying Grace, grace unto it." While preaching on the subject of opposition and persecution that had been raised against the church of God, I remarked, "Perhaps our congregation will say, why talk about persecution? That belonged to the dark ages of the world. We live under a government that protects all religions alike." But I remarked, "I have an engine of death at my feet"—then stooped down, took up the stick of wood, (which I was not able to lift with one hand) and said, "Now, this stick of wood was brought from our wood-house, this morning, and would have been put in the stove, after sermon, providing it had been so very different from the wood that we are burning. This stick, I have no doubt, contains a charge of gunpowder." The congregation appeared to be panic struck. I saw a few individuals turn very pale. I asked, "What is the matter with some persons in our congregation, that they look so pale and nervous? Is the poor, wretched, dastardly coward, who has committed this wicked and diabolical act, among those pale faces? What would have been the consequences? Look here—if you are in the congregation, you miserable wretch of wretches—see this dense crowd! Look at these mothers and children, crowded around this stove, the mother with her infant in her bosom, others with their little ones by the hand! Why do you want to kill those mothers and children? To tear this house to pieces, and destroy God only knows how many lives in this congregation? If I am the one you are after, you know my path. I cross this little field every night almost, in the dark, when I go home to the pastor’s house. Why not have taken your rifle and have picked me off on my way there? The Devil would have called that manly action; but all hell would be ashamed of such cowardly, wicked work, as this. Now, I want a committee appointed, to examine this stick of wood, and report, this afternoon, how much gunpowder they find in it. I do not want one Christian on that committee. All you citizens who are men of character, are fit persons for such an investigation." Four or five gentlemen volunteered to examine it, and the report (in the afternoon) was, that there were in the stick of wood at least two large musket charges of powder, which might have destroyed, for what I know, half of the congregation. I was informed some time after, by Dea. F., that a certain individual "come up missing" that afternoon. The Lord poured out his Spirit most gloriously , and I trust eternity will reveal many precious souls as sheaves gathered at that meeting for the garner of the Almighty. One word more about the pentecostal brother, and I dismiss the present narration. When the long gathering cloud was about to break upon us, probably there might have been over fifty, in different parts of the congregation, at the same time, crying out for mercy, or entreating to be prayed for. Stout men were on their knees before God. But, in the height of the excitement, our astonished church member exclaimed, "If this be religion, I do not want it." I replied to him, "Do not undertake to steady the Ark of God. Remember Uzza!" And, in a moral sense, I think he shared Uzza’s fate, for I do not recollect his praying again in the process of the meeting. I had been holding a meeting with the church in Phelps, Ontario county, under the pastoral care of Rev. I. Bennett. When I closed there, I was solicited by Rev. 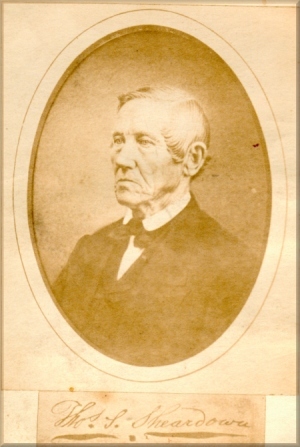 Z. Freeman, then pastor of the church, to assist him, at Seneca Falls. It was in the spring of the year, (in March.) We opened our meeting with some prospect of good. Every person acquainted with Brother Freeman knows something of his untiring labor in his calling. He said to me, one morning, "I wish you felt like taking a walk with me." The reply was, "I suppose a walk would do me good, but my mind is very heavily taxed." He replied, "Let us take half an hour’s walk, and it will clear your head some." After we had walked a short distance, he said, "I wish to call here—and that is the great object I had in view when I invited you out—to see if we could not make an impression upon Capt. S." I inquired his business. He said he had quite an extensive boat-yard. I asked him if he thought he was from the banks of the Cayuga? He said he believed he was, and that his father before him worked more or less at the same business. I told him, if so, I had formed an acquaintance with his father, the first year I was in the United States: he lived on what was called Crowbar Point. "No doubt the same man, my brother. His wife, I think, is a very excellent woman, and he is a fine man, but unconverted, and my great business is to see if I can induce him to come out to meeting." We made our call, conversed with his wife, and had an interview with him, but he said it was not possible for him to attend, as it was almost time to open the canal, and he had a vast amount of business to perform before that time. He had quite a number of hands working in his yard. Among them were several ship carpenters from New York. We had about given up the hope of making any inroads upon them, because they could not be induced to attend the meetings. Near by was a Methodist brother, one of the excellent of God’s earth, who frequently called upon me. While out to dine one day, he was present. The conversation in the first place turned upon his former occupation: he had once been a Captain of a North River craft, but at that time (if my memory is correct) was an agent for some house in New York, buying flour, and perhaps other property. After this conversation, he began again to lament over the condition of the yard full of men. He thought it was very bad that they could not be induced to come to meeting. I told him, if he would do what I would require of him, I thought that they could generally be moved upon to attend. He said he would do anything that lay within his power. I told him he could certainly do what I required. He replied, "I suppose, sir, you would not make any unreasonable request." I said, "No, by no means." The difficulty in my mind was, not so much in drawing the people out, as it was whether we had faith enough to hold them after they had once come. He said, "Well, sir, name it, and I will do my best." I said, "My brother, I want you to see Capt. S., if you can, before you make the effort: ask him the privilege of saying a few words to his work hands, just at the time when the bell rings for dinner. I want you to be on the bow of some boat that is on the stocks, and sing out to the men, just as you used to when you were acting in the capacity of captain on board your vessel—say to them, that there is a man preaching on the other side of the river, or outlet of the Seneca, at the Baptist church, and if you will oblige him with your presence, on Thursday evening, he will preach about "Old Ship Zion;" he will take you from her keelson to her maintop-gallant-royal. He is very desirous of having some hearers who might detect him in his errors, and give him some information. Now, boys, will you come, Thursday night?" He did his work, and they came, almost to a man. The text was 107th Psalm, last clause of 3d verse: "So he bringeth them into their desired haven." After going through with the sermon, while a short time was spent in conversation and prayer, I was circulating among the congregation, looking for those men. I took one by the hand and said, "I am indeed glad to see you, sir." While I was holding his hand, I saw marked upon his arm, (for his sleeves were partly rolled up) an anchor and cable, and remarked to him, "Where was that put on, sir?" He said, "On the other side of the Equator." I told him I was very happy to meet a man who had crossed the line, because he might be able to point out to me some deficiencies, no doubt, in my discourse. He replied, "Captain, you have seen a ship more than once." Having passed a few remarks with him, I left him, to look after others. Speaking with him the second time, I observed. "Sir, I suppose you are aware that I have left out one of the most important things about the vessel." " I think not, sir," was the reply, "I don’t recollect anything. I think you have done all that Mr. Kennedy said you would do." I said nothing pointedly to them in relation to the salvation of their souls, for I deemed it inexpedient just then. When I returned to my pulpit to dismiss the meeting, I remarked, "I have made a very grand mistake, in leaving out one of the most important things connected with the ship; and to-morrow night, if God will, I will tell you what it is. I wish to have your presence again." I took for my text, next evening, "Which hope we have as an anchor of the soul, both sure and steadfast, and which entereth into that within the veil." Their feelings had become enlisted, and they generally attended with us. But, after all, my heart felt sad—I did not know that nay of them had been benefited for the eternal world. Some years passed. I was about leaving home to attend a meeting, six or seven miles down the river from Owego. A person having died four or five miles from my home on the road which I was to travel that afternoon, a messenger came after me to preach the funeral sermon. I promised, on my way I would stop and attend the services. I was intimately acquainted with the greater part of the people who lived in that settlement, and, when I drew up to the school-house, saw a horse, sulky, and harness, which were different from anything I had seen in that neighborhood before. While I was hitching my horse, and thinking whose establishment that could be, a gentleman came up to me, took me by the hand, and manifested a great deal of pleasure at meeting me again on earth. I said to him, "Sir, there is something in your countenance that is familiar, but I do not know you." His eyes filled with tears as he said, "Do you not remember, sir, when you were in Seneca Falls, that the carpenters of the boat-yard were invited to attend your meeting?" I said, "Yes, sir, very well. I passed through scenes there that are fastly riveted upon my memory. "—"You recollect, then, sir, no doubt, preaching about ‘Old Ship Zion.’" I said, "Yes, sir, very well indeed do I remember the two nights I preached on that subject." His tears flowed as he added, "I was induced, by those two sermons, to set my foot on board that Ship, and I bless God that I am permitted to see you. I feel, now, as though I am bound for the desired haven. I was passing by here, and saw the people gathering. I asked them the cause, and they said Eld. Sheardown was expected to preach a funeral sermon." He continued, "It struck my mind that it might be a great deal of comfort to you, if you could know the fact, that one poor soul, at least, was blessed by that effort. I want very much to stay," he said, "but I cannot. I am out here picking up timber for boat-building; my hands have already gone on into the woods, and I must immediately follow them" I hope, when "Old Ship Zion" rounds-to at the pin-head in Glory, I may meet him there! Perhaps it may be thought by some that it is hardly compatible with the design of a sketch of my life, to be incorporating so many protracted meeting incidents. But they are an essential part of my ministerial career, and to me at lest are full of interest. One who has spent much time in evangelizing, might fill a volume with sketches which he considers profitable reading and worthy of a permanent record. I will venture to narrate a few more. In January, 1839, I was invited by Rev. A. Jackson, then pastor of the church, to labor at Big Flats—a field well known to me as the old stumping ground of my dear Bro. Gillette. Before he had got through describing the state of the community, and the situation in which the church was with some exceptions, I feared it would be pretty hard work, inasmuch as at the time I was well worn with previous labors. But I agreed to meet them at their appointed time, and do what I could. A few days after the meeting had opened, early one morning, one or two of the brethren came to me and said, "Now, Elder, we must close these meetings." The inquiry was, "What is the matter?" "Why, last night, sir, after the meeting was out, as the teams were going home loaded with our families and friends, we found that those large farm gates, with their big sweeps, fences, rails, &c., were laid zig-zag across the roads; and it is a thousand chances to one, that half of them were not killed. "—"Well, brother, who was killed? Who lamed? Whose horses’ legs are broken? "—"Why, through a merciful Providence, there was nobody injured, but they run a very great risk—too much to run again." I remarked, "If this is all the faith in God that you possess, I should not wonder much if the Lord should see fit to suffer some of you to be killed, for being so frightened and cowardly, while you acknowledge that He was on the side of His people. I won’t give my consent to close the meetings. I have never know a great work of grace, but what the Devil got very mad. If God helps me, I will try and preach here until my bones bleach on the moral battle field, or we shall see things in a different shape." Elder Jackson was a good man to stand up in the face of the enemy, and my heart felt encouraged that God would work by His people as soon as He consistently could. We soon had evidence that God was convicting men of their sins. Every day the work appeared to deepen and widen, and soon we began to rejoice that He was also forgiving sins. One peculiarity of the meeting was, that orthodox Christians living in that community, of different sentiments, took right hold of the work, apparently forgetting, for some weeks, the peculiarities of their respective denominations. One evening, a female was converted, and felt very anxious for the salvation of her husband, but he appeared not to be able to pass the strait gate, though evidently under deep conviction. He remained so for some time. I questioned the woman, (believing she was converted, and would tell the truth) if she knew what was the difficulty with her husband. She said she did not. I inquired what had been their habits of life. She said that he often spent his Sabbaths in fishing, hunting, &c., yet, from all that I could learn from her, there appeared to be nothing in the way of his coming into the kingdom of Christ, providing he was honest in the feeling he manifested. I saw him the next day in the congregation, apparently very deeply exercised; I pressed through the crowded house to the slip where he sat, talked with him, gave him such advice as was with me at the time, prayed especially for him, and he prayed vocally for himself. Still there appeared to be no God at hand. During the next services, he arose and exclaimed, "Shall I tell it? Shall I tell it?" He again exclaimed, "I must tell it, or go to hell." I remarked, "Tell it, be what it may." He exclaimed, at the top of his voice, "I am the man who helped to put the rails and gates in the roads!" I observed to him, "You say you helped: now tell who aided and abetted in the work? Who assisted you?" He paused and looked around. I said, "Tell us who helped you, or you will, after all, I am afraid, go to hell." He commenced naming certain individuals in the congregation, who must have felt as much ashamed as though they had been caught in their neighbor’s sheep-fold. There was another very singular circumstance connected with that meeting, which shows the power of God in his mysterious way of dealing, oftentimes, with very wicked men. One day, after the afternoon services, I was going to a house close by my stopping place, (which was with one of the blessed good Deacons of that church.) The day was cold, stormy, and snowing. A youngerly kind of a man, a perfect stranger to me, said, after we had passed out of the house, "I am glad, sir, that you are taking in hand that dancing school at the village; it exerts a very deleterious influence on your meeting. I hope the committee will be successful, and may prevail with the landlord to postpone the dancing, at least until after your meeting." I had hold of his arm, and as we were passing along I remarked to him, "Sir, do you profess religion?" He said, "No, sir, I do not. I am very far from that. "—"I wonder, sir," was my reply, "that you feel so much interested for the welfare of other individuals, and you yourself have no part or lot in the great matter of salvation." He said, "Now, sir, I will go back to the church," (where many were tarrying for the evening services.) I asked him to go and take some refreshment with me, and told him he would be welcome. I was very desirous to know more about his case, but he finally returned to the church, saying, "I hope to see you again this evening." I found him, when I returned, on his knees, with a number of brethren around him, praying alternately for his salvation. I went into the seat, kneeled by his side, and prayed, after which he remarked, "I want to speak a few words to you, sir. I should like to tell you who I am, and what I have been." He remarked, when in conversation with me, "I was born in Connecticut; my father and mother were Methodists, I believe very good people. We used to have prayers in the family when I was a lad at home. I had a great passion for riding horses, and when my father and mother left me at home alone, I would get father’s horses out, take them into a back field, lead one, and ride the other, and thus try their speed at every opportunity. I became quite an adept at riding." I think he said when he was in his twelfth year, his father and mother went from home, (whether to be gone for the night or not, I am not able to say,) and there was horse-racing, something like a mile from where they lived. His father, he said, charged him, over and over, "Now, you must not run away and go to those horse races." He promised he would not, but, as soon as he thought they were sufficiently out of the way, he started for the ground. This was the last day. There was an animal called the "Little Virginian"; her owner was very anxious she should run, but he could not find a rider light enough. The lad listened to the conversation, stepped up and said, "I will ride her, sir." The man inquired, "Are you in the habit of riding horses?" He said, "Yes, sir, and I can make that little mare do her best." He was engaged to ride; he rode, and won the race. The owner of the mare kindly said, "Now, my boy, I want you, and I will make a man of you, if you will come with me. You shall be my rider. Now, will you go?" The boy said "Yes." "Well," said the man, "we must go right away." And so he concluded to go, and kept traveling down South as far as New Orleans. "My employer," he said, "always took me with him; I lived as he lived, and he treated me no doubt as he would his own child. He gambled a great deal: it was about his main business, when he was not engaged in racing. I learned to gamble; he taught me all the arts and tricks he was acquainted with. I finally thought I was a master hand, and, seeing him often take great piles of money, I concluded to begin for myself. I commenced," he said, "on my own hook, and from that day almost to the present, it has been my business, more or less. Sometimes I was very rich, and sometimes very poor, without the means of getting a meal of victuals." I asked him, "Did you ever attend church while you were engaged in this nefarious business? "—"Yes, sir; gamblers almost always attend church; it is a very good cover for a gambler; if you are seen frequently at church, people will not be so suspicious of you. "—"Well, sir, when did you quit gambling? "—"I came into this region of country, several months ago, perfectly broken down. My means were all gone, and when I tried to gather up, everything turned against me. I was at Wellsburg, and used to hear Eld. Brown preach. He often spoke to me, when I would give him an opportunity, and talked on the subject of religion. That was very favorable for me, because Wellsburg is a small place, and a man is very easily found out in those little villages. I thought to myself, I had stayed there long enough: I could not effect anything, and came to Big Flats, where I thought I must do something. I concluded to go to work in the broom manufactory." "All was going on with me, sir, as usual. But I dreamed, last night, that I was in Wellsburg. I heard a person say, ‘Eld. Brown is dea; they have sent for Eld. Jackson to preach his funeral sermon.’ I concluded to go to that funeral. The corpse was brought into the meeting house, in the coffin. I heard Eld. Jackson preach. After the sermon was over, Eld. Brown rose up in the coffin, pointed to me, and said, ‘Sir, I have warned you to flee the wrath that is to come, and now God has permitted me so far to rise from the dead as to give you the last warning. If you do not repent, now, you never will repent.’ While I was pondering it in my mind whether I should repent, now, or wait a little longer, something (I can not describe it) came, caught me up in his talons, and carried me off with all rapidity: just as I came in sight of the most awful place I ever saw, I woke up. I felt sick. I was boarding at a Baptist woman’s—a member of this church. When I came downstairs in the morning, she remarked to me, ‘Why! You look like a dead man: what is the matter? Are you sick?’ I paused, I did not know what to say. I said, ‘No, not really sick: I had a very strange dream; it appears to have unmanned me.’—‘What have you dreamed?’ I commenced relating it. Just as I had got through with the narrative, a lady came in—I believe she is a member of this church, too—and said to the woman with whom I was boarding, ‘Have you heard the news?’ ‘No, what news?’ ‘O, dear Eld. Brown is dead, and they have sent for Eld. Jackson to come and preach at his funeral.’" He continued, "I was crushed down. I sat down, and felt as though I had not power to stand up. I concluded, at once, if I was able I would try and come to this meeting—that, after all, the warning of Eld. Brown might have that impression upon my mind, that should make me a good man—that I might serve God." After our conversation, it was imperative that I should take hold of the meeting, preparatory to the sermon. In the course of that evening, while some brother was praying, the young gambler was hopefully converted. Then, his great anxiety appeared to be, "Are my father and mother alive? Have I broken their hearts? May I never see them again? I have never written to them, and have never heard from them since I left. But I shall see them, if they are alive, as quick as I can get there." I remarked, "I will have a further conversation with you, sir." I inquired for him the next day, but was informed that he had started for Connecticut—he could not rest until he knew the fate of his parents. I thought, in view of this occurrence, "God preserve our children, our young men, from the dark and wicked pathways of the horse-racer and the gambler!" It was always gratifying to have a call to preach the Gospel in places where sin and wickedness abounded, because, (I have thought) some ministers appear to studiously avoid them. And indeed we often find, in some of those lesser places, the deepest sinks of sin and pollution, anywhere on this side of the kingdom of darkness. I had an invitation to go to a certain place in the State of New York. The person who invited me, said, "Now, sir, I want to tell you the truth. It is the wickedest place, probably, in seven counties. I don’t know whether you will be able to preach or not. Things have been in a very bad shape there for some time. But something must be done, or the wicked will tread the little church beneath their feet. I made some inquiries to know what the great difficulties were. He said there was a class of men who feared neither the laws of God or man. They had almost driven every minister, who had tried to preach there, from his pulpit. I was somewhat acquainted with the brother who had been trying to preach to them, and believed him to be a very good, but by no means a great man. His knowledge, perhaps, of human nature, was not large, and he had been badly used. I came to the conclusion that I should try what could be done. I rather feared to open the scene entirely alone, for I was informed that they had given notice that an Englishman would preach at their meeting-house, the next Sabbath morning, and also that there was a combination, embracing both males and females, who sometimes had gone so far as to use a large syringe and throw from it dirty water into the minister’s face, while preaching. They had been prosecuted again and again, and fined from twenty-five to seventy-five dollars; but they would club together, pay their fines, and very soon get up another insurrection. I concluded to stop in a neighboring town, where I was intimately acquainted with the Baptist church and their pastor, the Rev. J. H. Stebbins, (a choice young brother—a man after my own heart) and try to get, from some of the leading brethren, consent for him to be present with me at the opening of the meeting. They cheerfully consented, and he as willingly accepted my invitation. We arrived at the place, on Sabbath morning, about ten o’clock. The church was not enclosed by any fence; the lower pannels of the outer doors were broken in; and the vagrant sheep appeared to have enjoyed the shade of God’s house and made it their place of retreat from the flies. There were a few old sheds, but they were so near falling down that we dared not hitch our horses under them, but tied them to a fence, and went to reconnoiter the inside of the house. There was no sign of a path, through the grass-plot that was spread out in front of the sanctuary, and no marks of life, inside or out, except that of sheep and cattle. I said to my brother, "This is a hard looking place." Time arrived for meeting, but no person came. I was examining the inside work, and saw a hole in front of the pulpit. I put my eye to it, and could see a small glimmer of light from the outside. I said, "Bro. Stebbins, look here: this has been done by a rifle ball." After examining it, he concluded that it was indeed a rifle shot; it had passed through the front of the pulpit, between the studs and through the siding. While we were pondering those things in our minds, and what would be the result of labor in that place, an old gentleman came in. We inquired of him, "Is there meeting here today? We thought you were to have an Englishman to preach here. "—"Well," said he, "We had some ground to expect it, but I presume he has heard of us, and will not come. If he is wise, he’ll never show his face in this place." I asked him what hole that was in the front of the pulpit? "O," he said, "it was made by a wicked man who swore he would shoot God Almighty’s house down." We asked him if it was in the time of service? He said, "No, what few of us were here, had just got out of doors." About this time, one or two others came in, and, a little before noon, we might have had a dozen hearers. I said, "Now, friends, I am the Englishman for whom the notice was given to preach here, at half-past ten this morning. For some cause or other, there are but few present. However, we will sing and pray, and then I will try and preach a short sermon to you, after which I will tell you what I want you should do. After preaching, I said, "Now, I want you should run around among your neighbors, see every person you can, and tell them the stranger is here, and will preach this afternoon, at two o’clock, and he wishes everybody who gets the word to come out and hear him." They stirred the turbid pool, and several came out in the afternoon. We made another appointment for the evening, when the congregation was much larger. I went right on, and made my appointments for Monday, paying no attention whatever to what we had heard. The house which was assigned for me as a boarding place, was a very good place. The man was very eccentric, and could drop down from the sublime to the ridiculous the quickest of any one I ever saw. One specimen of his peculiarity will suffice. We were attending family prayer, and before rising from our knees he turned around upon his knees and exclaimed, "Elder! Was not that a fine roast pig we had for dinner, yesterday?" Notwithstanding all this, some of the family were pious, and it is seldom that an evangelist, in such a place, meets with a better home. We asked the old man in relation to the trouble that they had, and why they could not hold meetings in peace? He remarked, "I can not tell you anything about it, because I can not tell it bad enough; but if you do not find it out, to your sorrow, I shall wonder." I know no other way than to pray and keep the powder dry. On Monday, everything went off very well. Tuesday, not anything occurred very bad. I preached three sermons each day. I think it was on Wednesday afternoon that I saw them passing around slips of paper in the gallery. Things looked to me as though the hosts were marshalling for an attack. I stopped preaching suddenly, and said, "There, now! There is always something troubling me when I am try to do good. There flashed across my mind what I had heard on my way to this place. You do no know me, here. I never was through this hollow but once in my life, and then I was on my way to Rochester, and made no stop. But in the towns, South and East of you, I am considerably acquainted; and it is always customary, when I am in any of those places, and they know I am on the travel, to ask, ‘Where are you going, Elder?’ I answer, to such a place. When on my way to this place, I am asked, ‘What are you going to do there?’—‘Going to hold a protracted meeting.’—‘Why, you cannot do anything there: they will skin you.’—‘Very well,’ I would reply, ‘God permitted me to have a skin, and if he permits the Devil and his emissaries to tear off my skin, I wont find fault.’ Others have asked the question, ‘Where are you going? And when I have told the, they would say, ‘Why, it is impossible to do any good, there; I think it is the wickedest place on God’s foot-stool.’ I observed that I did not know anything about how wicked the people were; I had heard that they were a wicked people; and where shall we go and not find wicked ones? The final answer was, ‘Well, try it, and if you come out with a whole shirt or a whole hide, I shall wonder.’ This is the character you have abroad, in the neighboring towns. These are the interrogations and sayings I have met with, on my way hither. Now, I want to be able to say, hereafter, that I cannot vouch for it that one word of all this is true. So far, you have treated me as kindly as I could have expected to be treated. And I want to say to you, if you are the people as represented to me, I shall find it out. But there is one thing more. I profess to be a Christian minister, and I hope a gentleman in manners; and now I wish you to watch me with all interest, and if you hear me say anything, or see me do anything, that you think beneath my character, as a minister or a gentleman, just come right to me: I will gladly receive you. Point out my fault, and convince me of my wrong, and I will get down on my knees to any of you, if it is a child five years old whom I have injured, and confess all my faults, for I have no business to act wickedly. Now, keep your eyes steadily on me, and your ears open, to see and hear all that is said and done." I saw that they were calmed, so I proceeded with my sermon, and closed the day without the least sign of a break out. The meeting continued well for a day or two, when I saw the same evil spirit manifesting itself. I stopped suddenly again, and said, "Now, what do you suppose I am thinking about? The miserable things that I told you before, are now troubling me again, though in a somewhat different way from the first time. I am now thinking what those people will say to me on my return, (for I shall pass through some of the same neighborhoods that I did in coming out.) You have treated me very kindly, I feel very happy amongst you; everyone looks pleasantly at me; I am well cared for; and I expect, when I go back, I shall tell a story that will startle the people a great deal more than the stories, I heard on my out, startled me. I think I shall have it to say, that I have seldom fallen among a people who have treated me more kindly, or heard me preach more patiently, than you have in this valley; and I expect, that if people shall again tell me this bad thing and the other bad thing of you, I shall be able to reply that I left here at such a time, and must say the people are not deserving of the character you are giving them. I believe I shall give a very different report of this place, than, perhaps, has ever been given before. Now you watch me, so that I do not do wrong, and tell me of it if I do. I will watch you, and if you do anything wrong you cannot help but acknowledge that I have a right to demand the same from you that you demand from me. We are going on in peace, as we have so far. I am going to do you good, if I can. And I pray that I may not be left to do you any harm. We have met as friends, we will try and part friends, and I know I shall give a good report of you when I leave this place. Now I will finish my sermon, and I hope these things will never trouble me again while I am with you." That evening, or the next, when the meeting was dismissed, I heard a man call out in the darkness, "Where is the Elder?" with a prefix, that I will not name, to the word "shame." I concluded, of course, that the one inquired after was myself, and said, "I am here, who wants me?" A man came up to me and said, "It is a shame, with so many folks here, for you to have to walk to Mr._____’s such a dark night as this. We have got a carriage here, sir; wont you ride? We don’t go your way, but that is nothing; we can soon take you home, and turn about and come back." Perhaps there might have been four or five in the carriage, (for it was what some folks call a wagon.) As soon as we were fairly in the road, the driver cracked his whip, the horses sprang with a will and I said, " That is right, sir; I always feel safe with a good team and a good teamster—let them slide." They turned me up to the door of my boarding house, and lifted me out of the wagon. I thanked them kindly for the great trouble in coming so far out of their way to take me home. They replied, "O, it is a pleasure, Elder, to do it—it is a pleasure, sir—it is a pleasure, sir." God very soon began to magnify the riches of His grace in the conviction and conversion of both men and women—not a dog moved his tongue—the congregation was still and solemn as the grave. The few brethren and sisters felt as though God was on their side; they were strong in the Lord and in the power of his might; they found that their bands were loosed, that their feet were upon the necks of their enemies, and Christ was claiming the purchase of his blood. We labored on successfully. It was evident that that community was not what is often called a "Gospel-hardened people." They had not heard enough of the Gospel, perhaps, to harden them, in the common acceptation of that term. I well recollect, while preaching one afternoon, a solemn awe appeared to rest upon every one present, when a young man arose and exclaimed aloud, "I shall be damned! I shall be damned! O, I am lost! O, I am lost!" The congregation were pretty much all in tears. I stopped preaching. He cried out, again, "I must pray, I must pray, or be damned!" He kneeled down of his own accord, and prayed in his own way, audibly, so that perhaps every individual in the house could hear him. He arose from his knees, took his seat, and appeared to be calm and placid. I moved on with my sermon, and had spoken perhaps five or seven minutes, when he again arose, and exclaimed, "I am afraid I ain’t saved! O, I ain’t saved! I must pray again. O, do let me pray!" I told him to pray on his own way, asking God simply for that for which he felt so much need—to be saved. The sermon, of course, came to an end, in about the middle of it. But that made no difference. I never saw the time when I wanted to preach, when sinners wanted to pray for the salvation of their souls. Their previous pastor or preacher—although, as before remarked, a very good man—had scarcely dared to show himself in the house of prayer, but he was now greeted cordially on every hand, and everybody appeared to love Eld. D.
I do not now know how many were baptized, but quite a number. I recollect one incident that occurred at the water’s side. There was a poor, miserable, wicked backslider, who had made more or less trouble for individuals through the greater part of the meeting. He was talking boisterously against Dea. K. and Dea. G. He finally addressed himself to me in a very unbecoming manner, when a stout, athletic man, came up and (I am sorry to say) made use of a word that I can not use, adding, "I will shake you out of your boots, if you do not leave this place, immediately. What! Abuse this man, who has treated us like a gentleman ever since he has been here? Now, if you do not hold your tongue, and get away from here, I will knock you until you will not be able to get away." I saw no knocking, but I did not see or hear anything more from that individual. We closed in great peace, God giving us a gracious blessing, and I returned home rejoicing. Twenty-three or four years ago, I was called by Rev. A. C. Mallory, then in his first charge, to hold a meeting of days with him and his people. I could not deny him any aid that was in my power to render, for I had promised him and God that anything at any time (other things being equal) that I could do for that church, should be cheerfully done. I knew everything would go smooth as regarded him and myself, for we were not only like David and Jonathan, but like Paul and Timothy. God was pleased to hear the prayer of his people—and, by the agency of the ever-blessed Spirit, many souls were hopefully converted. One circumstance connected with this meeting, has always appeared interesting to me. A number of converts, and a large congregation, repaired to the head waters of Crooked Lake, where Bro. Mallory was to administer the first ordinance of the Gospel to those who had previously been born again. As we were passing down the hill to the place of baptism, I saw that the lake was frozen some distance out from the shore. Man, no doubt, observed this as well as myself. The crowd came upon the beach, and, while passing through the preliminary service, the anchor ice appeared to break loose from the shore, and commenced receding into the lake, so that, by the time my brother was ready to administer that sacred ordinance, the ice was sufficiently out of the way, apparently standing at bay by God’s command, like the liquid walls of the Red Sea. After baptizing quite a large number (I do not recollect how many,) we retired from the water’s side, where prayer was wont to be made. The ice gently began to return, and ere we had arrived at the same elevation at which we were when we first saw it on our way down, the ice had entered its former position. We never thought that God wrought a miracle for us, but to this day I have never been able to give a scientific answer to the many inquires that have come to me, as to the cause. I leave that for those to solve who have a more philosophical pate than mine. I was invited to hold another meeting, with a choice church, where I was some acquainted, and a pastor I placed among the best in my knowledge. When I arrived at the pastor’s house, his wife remarked, "Mr. R. is not at home, sir, just now. Will you be kind enough to put your horse in the stable?" I replied, "Yes, ma’am, I am always able to take care of my own horse, when able to ride." I did as requested, and was kindly received. Shortly after, a girl of fourteen years came in with a pail full of hot apple-sauce, a present from a neighbor to the pastor’s family. While the woman of the house was taking care of the sauce, I was talking with the girl about the interests of her soul. I inquired her name, which she meekly gave. I remarked I did not know a family of name in the region. She said, "I am living near here, sir, but my home is quite a distance from this place. I live with Mr. ____." I said I could not call him up in my memory at that time. She inquired, "Which road did you come here, sir?" I told her. She remarked, "You passed the house. Did you not see, a short distance from here, a very fine brick house? It looks like a mansion." I asked if they were professors of religion, there? She replied, "No, sir. "—"Are there no persons in your house who are Christians? "—"I think not, sir. O, stop—I think I am wrong. Grandma lives with us. I have often heard her praying, all alone, in the garret. So I should think she was religious." About this time, Mrs. R. came in with the pail nicely washed, and remarked, "This young friend is a member of my Sabbath-school class. I think a great deal of her. I hope she will be converted in these meetings." I said that we had conversed some on that subject, and I felt sorry to learn from her that the family with whom she lived were not religious. I then asked the girl, "Will you take a message from me to Mr.___and Mrs.____? Tell them you met, at the pastor’s house, the minister who is going to aid in the protracted meeting. Say to them that he thinks it is very wrong for any person—and especially for those to whom God has been so very kind in giving them the good things of this world—not to love and thank Him for it. And that Eld. Sheardown sends his kind regards to them, and invites them to come and hear him preach. Now, will you do that errand, just as I have told it to you, as near as you can? "—"Yes, sir." The pastor’s wife smiled as she inquired, "Elder, what do you know about Mr.___?" I replied, "Nothing at all—but I know if he is not converted, he ought to be." The response was, ""If you knew as much as we do, perhaps you would not manifest as much anxiety. "—"Then I am very glad I do not," was my reply. "Is he an Infidel? "—"I don’t know. "—"Does he attend church? "—"Very seldom. But my husband will tell you all about it, probably, when he comes home." Bro. R. shortly arrived, when his wife reported the circumstances of the conversation with the little girl, and the message I sent—and both, I thought, treated the subject very lightly. My spirit was grieved, but I made no reply. As the days passed away, my frequent inquiry was, "Was Mr.___in church? "—"No, indeed not: what makes you so concerned about him?" My reply would be, "he must come—I believe he will be converted." The pastor remained incredulous. Notice was given that on such a day I would preach an Agricultural Sermon and hoped that the scientific farmers especially would come and hear. The gentleman referred to (to me unknown) was said to be a model farmer. On hearing the request, (as I was afterward informed,) he said, "I will go and hear that man preach about farming—for, if he knows anything about it, he is about the first minister I have ever seen that is worth a snap at farming. He may learn me something, but I doubt it." Just before I commenced the sermon, the pastor said to me, "Do you see a gentleman sitting by such a window, with florid face, a scarlet silk handkerchief on his neck?" I looked up and said, "Yes, who is it? "—"That," he replied, " is Mr.____." My heart filled—I could not restrain my tears—for I had not ceased to pray for him from the time I sent the message. My text on that occasion was, "They who sow in tears, shall reap in joy." During the sermon, he rose up several times, and appeared very uneasy, as though he was tired of sitting, or some other trouble. When I closed the services, I went down to the last step of the pulpit stairs, (which was close by the door,) shook hands with some friends as they were going out, and when he came along, kindly offered him my hand, called him by name, and said, "A very pleasant day, sir." He passed on, and I said no more. He continued to come, and was very soon deeply affected. I concluded to approach him, and have some conversation about the interests of his soul. He remarked that he supposed that there was no hope for him. I inquired the reason. He said, "Sir, I arose two or three times to speak while you were preaching the agricultural sermon. I felt so convinced of my state, that I thought I must do it. I have thought, ever since, that that was the time, and I let it go by. I thought it would be considered rude, and out of place, to speak during the sermon, and I think now, sir, that there is no hope for me." I invited him forward to an anxious seat. He came without hesitation. He told us how much he needed religion; what his fears were; as for hope, he had none. I gave him the best advice and instruction I could, but he remained in that gloomy, dark, troubled condition. He would talk, confess his sins, pray for himself, become perfectly prostrate while trying to pray, but all did no good. I had been led into the secret of the trouble. One evening, after all effort appeared to be ineffectual—when he had prayed and wept, and became almost as weak as a child—I said, "God help you, sir, to go home and confess to your wife and children." This was spoken audibly, so that all might hear. He took his hat, and left the meeting. I heard no more of him until about five o’clock the next morning. I was awake, and thought I heard an unusual noise somewhere near the house. The first thing I distinguished, was a rap at the door. The pastor got out of bed, and answered at the door. The next thin, I heard my brother say, "he is in his room;" and very quickly followed a rap at my door. I was about half dressed, and opened the door, when who should appear but Mr. ___and the pastor! He threw his arms around me, and brought me on my knees on the carpet, (and he came with me). The pastor and I prayed for him, but he had got such a death-like grip upon me, that I could not rise. Finally, the pastor left us alone, when I talked and prayed with him until about seven o’clock in the morning, when his ebullition of feeling appeared to subside. Yet I could see no signs of a regenerated heart. Before he left, he remarked, "I do not know what to do, sir. I have special business to-day, in a village twenty miles from here. I must go—I ought to go—but how can I go? I can not look at any person without shedding tears." I advised him, by all means, to redeem his pledge. On his knees, he told me, perhaps, all his troubles. I said, "Go, sir, take your wife with you in your buggy, and do your business." He took his wife with him, as advised to do, to transact his business. On the borders of the village to which he had gone, there is a beautiful farm, of which he had often said, (as reported to me) that, if he had that farm, he would ask no odds of either God or man. He was driving along the road, just before sundown—one of those beautiful autumn sunsets, with a clear sky, serene, frosty air, the seared leaves and the last rays of the setting sun throwing beauties all around that habitation—and as he cast his eye upon it, he thought he never saw such a change as had taken place. There was nothing in it, or about it, to him desirable. While these thoughts were passing his mind, this passage of divine truth came with great power and sweetness to his heart: "In my Father’s house there are many mansions; if it were not so, I would have told you. I go to prepare a place for you, that where I am there may ye be also." His soul was happy, and a sweet sense of pardon rested upon his mind. These circumstances, I think, took place at the same time that earnest prayer was going up for his salvation at the church. I saw him, with several others, follow Jesus in the first ordinance of the Gospel, in Cayuga Lake. The last I heard of him (for I do not know whether he is living or dead) was that he was striving to make his calling and election sure. Another incident, in the same meeting, may be worthy of notice. One day I preached a very pointed sermon on card-playing and other kinds of gambling. After the meeting, a member of the church, who I believed to be among the best of men, remarked, "You have preached a good sermon, sir, but it will be lost on this community; we have not got the people here who are addicted to the habits that you have been talking about." I replied, "I am very glad of it. I hope it may be lost for want of adaptation to the community, or any part of them." Things passed on but a very short time, when a lovely young man, the son the brother just referred to, appeared to be under wonderful conviction. When interrogated in relation to when he first felt the magnitude of his sins, his answer was, while listening to the sermon on card-playing. He said, "I have often stayed at home, when father and mother went to meeting on the Sabbath, and some young friends would come in, when we would play at cards until about the time for them to return from church; then we would adjourn, to meet again, if the weather was pleasant, in the afternoon, in a certain piece of woods, which he designated; and of all his sins it appeared to him the sin of playing cards on the Sabbath was greatest transgression. The dear young man was hopefully converted to God, and for all I have ever heard of him have every reason to hope the work of grace, upon his heart was a genuine one. Permit me to relate, here, a few facts by way of warning or caution against the difficulties which may arise out of undue political excitements. It will be fresh in the minds of many of the older members of the churches, that there were fearful alienations in the election of 1840. I recollect of holding a meeting, with a certain church in the Lake country in which I was considerably acquainted. The pastor was a very good man, and I had some hope of seeing much of the salvation of God, if there was not something beneath the surface that we could not see or reach. Commencing labors, as usual, a large congregation was gathered together. Truth appeared to tell upon the hearts of impenitent sinners. It was a common-place conversation, that men in their prime, and some almost in the evening of life, appeared to be powerfully moved, even to tears. Yet we did not appear to be in possession of that converting power which comes from above in answer to the prayers of God’s people. I felt in my own heart that it was very up-hill business, and often conversed with the pastor, why things should remain in their present state—so much powerful conviction, and still no evidence of regenerating grace. His answer was about the same, always—that he could not tell—but it was evident that there was something wrong. Brethren appeared to be honest in their confessions; they would pray, exhort, and sing, but the real motive power appeared to be absent. The word had gone out that such and such men were under conviction, and brethren and sisters came in from neighboring churches. They took hold, and labored, apparently in the Spirit. We began to find here and there a hopeful convert, apparently very weak, but still giving signs of spiritual life. They appeared to be willing to do their part of the labor, but they had not that vivacity which is generally found in new-born souls. We struggled on until it was said by some that there were perhaps forty hopefully converted to God. I had heard a certain individual pray, several times, in the meeting, that the Lord would be pleased to bless the effort put forth for the salvation of souls. I heard him pray, the last evening of the meeting. In that prayer, he expressed great satisfaction that it was just as he had prayed daily that it might be—that little or nothing had been effected! I felt intensely under such a prayer—how it could be, that there could be such a contrast between the former, and the last, closing prayer of the meeting—and endeavored to ascertain the reason. I was told, that the house of worship had been opened, as the most convenient place for one political meeting, and that the opposite party (to which that brother belonged) made application for it, but were not permitted the use of it. I watched with some interest the ultimatum of the meeting, relative to the converts. We were told some went to such a denomination, while others went to other Baptist churches; and the summing up, according to the statement of my informant, was, that not one was added, as the result of that meeting, to the church where the labor was performed, although, I think some did not live more than a rifle shot from the meeting house! This was a very melancholy report, and I hope my ears may never be saluted with the like distressing details. In the winter following the political struggle just referred to, after the excitement had in a measure passed over, I had given a pledge to a dear brother minister, laboring in a little church with some strength and moral power, that, if God spared my life one year from the time, I would be on hand and try, by the grace of God, to assist him in a protracted meeting. The understanding between the pastor and myself was, that if any obstruction should be thrown in the way, so that it should not be considered best to make the effort, he would write me in season. I received no letter, consequently concluded the way was open, and shaped my course accordingly. I wished to redeem my pledge to the day, and in so doing had to drive sixty miles in my buggy through one of the coldest days following a January thaw. I arrived just about dusk, and saw a number of people standing around the pastor’s door. I believe there was but one member of that church whom I had ever seen, and I had never before been in the town. I drove up to the gate, sat in my buggy, and thought, "Now, this is the house—I cannot be mistaken," for I had inquired but a short distance back, and it answered the description that had been given. The thought struck my mind, "Is it possible that Eld. Dudley is dead?" Still I sat in my buggy, taking it for granted that some of those men, standing in the door-yard, were members of the church. I remarked to them, "My name is Sheardown." They looked at me, but paid little attention. One individual looked around, and proved to be the brother who was in company with the pastor when I gave the pledge in Vienna, the year previous. As soon as he recognized me, he came up, and gave me a warm shake of the hand. I said to him, "Now, sir, I am here, and, if I am wanted, will get out of my buggy, for I am very cold. If not, I will drive on a little further, and put up for the night, for I am wanted in Lyons." By this time, the pastor was out, and cordially received me. But I saw there was trouble with him. He wept, and smiled at times through his tears, and finally said, "It is my donation, to-night. Now go right in, sir, make yourself at home; I will take care of your horse." I requested him to direct me to a part of the house where I might meet his wife, or some of the family, and obtain a spot to wash and make my toilet before entering the crowded part of the house. I succeeded. As soon as it was known by many that I was present, they said, "Now, can not we have a sermon to-night?" My reply was, "Not from me; but if you will come together to-morrow night, at the church, you may, God willing hear me preach." The bustle of the evening over, the pastor and his little family and myself alone, I inquired about the prospect of a meeting, and what appeared to be the state of the church, the feeling of interest in relation to attending meeting, and all the little inquiries that necessarily come up between pastor and evangelist on their first meeting. He replied, "O, we shall have meeting." But there appeared to my own mind to be something very indefinite in answer to many questions that were put. I could not fathom the mystery. He had provided a very pleasant, cozy place, as a domicile for me—everything desirable—library, stove, bed, everything in fact, of this kind, that was calculated to make the inmate comfortable. He told me, the next day, he had an appointment for me in the evening. I went to church—a small congregation. I inquired of him, "What is the order of arrangements for your meeting?" He answered, "You may give notice that you will preach again to-morrow night," which I did, still wondering that he had no plan to name relative to his future movements. I attended the meeting agreeable to appointment—was again request to have meeting the next night—and this, I believe, brought us to about the close of the week. Then it was necessary that something definite should be decided upon relative to our future labors. He said, "Well, now, I will tell you what I want you to do. I want you should give notice, Sabbath morning, of just as many meetings as you feel able and willing to attend through the week." I replied, "I should like very much, my brother, for you to make some statements, yourself, concerning your meetings, and give the notice yourself." But he evaded and said, "You must do it," and everything was very dark. I could not pierce the gloom—his conduct appeared to me to be inexplicable. So I made appointments to suit my views and feelings, in view of the work to be performed. I had now got upon the track, but the great thing was, the motive power did not appear to be there. Some of the brethren and sisters of the church attended, but I believe not by any means all the pastor expected. Some were always willing to pray, and willing to talk. I tried my best to rally the forces, and marshal them in the conflict, for we expected a hard struggle, and indeed it was for many days. There was no lack of attention to the Word, and the feelings of the impenitent appeared far above those of the church. There was one little circumstance that I have never been able clearly to account for, in relation to myself. On the pastor’s writing desk, with some open letters and papers, was a letter superscribed with my name. I had seen it, every day; had taken it in my hand, looked at the direction, and laid it down again—never thought that it belonged to me, and it was not my business to be quizzing any of his papers. My spirit became crushed very much. I endeavored to cry mightily to God to know why He was thus contending with us. I knew it was for His glory to save sinners, yet it looked to me as though the effort must fail. In the multitude of these thoughts, after having said everything that I thought I could say, to admonish, to stimulate, and to stir up, yet, to bring into action the sacramental host, in that place, appeared to require a power that I was afraid God had not given me. I made up my mind to preach from the text, "Sanctify yourselves against to-morrow; the Lord will do wonders among you," and I preached from that text as well as I could. The morrow came. I was preaching in the afternoon, when there flashed across my mind what I had preached the evening previous. Everything appeared to remain the same, and the thought struck me, that now the people will say, "To-morrow has come, but you have lied in the name of the Lord—things remain as they were." I came very near breaking down entirely, but a flood of tears came to my relief, and I was enabled to double the cape and very soon feel the effects of the trade-winds. I had scarcely said amen, when a leading member of the church, who had been standing through the services in the broad aisle, (for the church was a perfect jam)—his countenance often had paled, and his chin quivered—this brother then, with one mighty effort, threw his arms around his pastor’s neck and they came down upon their knees in the midst of the great congregation. The member cried out, "O, Bro. Dudley, forgive me, forgive me! Whenever you brought up the subject of a protracted meeting before the church, I always opposed it. You remember, at the last meeting when you named it, I took my hat and walked out of the covenant meeting. I would not hear you, and about all the church followed me." This lifted the latch, opened the door, gave me an admission into the secret audience chamber, and shed a light upon those difficulties that had so much hindered our progress. Returning to my room after service, the first thing I did was to take up the letter referred to before, and on opening it I found that it was a letter that had been written to me, at a very late date, by the pastor, (in which he appeared to have little hope that it would reach me, previous to the appointed or promised time that I was to be with him and his people). But the letter had never been sent. The secret came out, that when that leading brother had induced the church to follow him from the meeting house, there were but two left—the pastor, and one very good man—who finally came to the conclusion, that the pastor should go home and write a letter, if so be that it might reach the evangelist, and turn his steps another way. The brother was to remain at the church, take the letter, and drop it in the office on his way home. When the pastor returned to the church with the letter, the brother who had remained in waiting said to Eld. D., "We must not send this letter. I have been praying, ever since you left; and when I prayed we might succeed in preventing Eld. Sheardown from coming here, all was dark and gloomy in my mind; but when I felt reconciled to let the thing stand as it is, and let the man come, all appears to be bright as day. Therefore, I say, let the providence of God rule in this thing. After he comes and preaches a few sermons, he will get the people out, and we shall see what the mind of the Lord is. If he must leave, I will pay his traveling expenses, and we will get out of the thing the best way we can." This, of course, previous to the confession, was all in the dark as it regarded myself. One other instance that occurred in this meeting. I have said it was the winter following the great political conflict of 1840. We were moving on; the power of the Highest appeared to rest upon the people; and converts were daily multiplying. There was a brother of rather superior talent, one of the sweet singers in Israel, who had got pretty deep into my heart. He labored well. There was a certain other gentleman, unconverted—a man rather above mediocrity in his appearance and all his demeanor. His wife, and a little niece, I believe, were hopefully converted to God. He appeared to be the subject of very deep conviction, and remained in that state some days. We could not see what obstacles were between him and the Saviour. I observed, that while the brother just referred to was talking, this gentleman’s tears dried up. He looked, to me, as though he had speedily got into a hardening process. I concluded to watch the thing closely, as the convicted man very soon gave all the evidence that he was the subject of great anxiety of soul. For two or three meetings, when the above-mentioned brother spoke or prayed, it produced the same effect upon the trembling sinner. I concluded there must be something wrong, and in consequence took the brother by the arm and said to him, "Do you think you have made all the confession you ought to make? Or is there something left behind?" He remarked, "I do not mean to be dishonest. I think I have done in that respect all my duty." Of course, I could not say that he had not, and had no business whatever to judge his heart. But the circumstances that had appeared before me were fraught with something that indicated wrong. While preaching in the afternoon of the same day, I made some stirring remarks in relation to brethren throwing stumbling blocks in the way of sinners, growing out of the political excitement of the times. It was a perfect digression, the remarks not growing out of my subject at all, but they passed for what they were worth. Immediately after sermon, the brother arose, called the gentleman by name, and, with a heart apparently dashed like a potter’s vessel, said, "O forgive me, forgive me—I have done very wrong; I know it, now. I did not see it, before. Your politics were the opposite of mine. You know I would often drive around, on your carriage road, with my buggy blazoned with "Tippecanoe." I would sing a song, crack my whip, and was gone. I knew it would make you mad. I did it willfully. I am very sorry. If you can, I want you should forgive me; and if there is anything else, that I do not see, that I have done, that is in the way of your soul’s salvation, do tell me. I would not stand between you and the salvation of your soul, for the world." While this confession was going on, the gentleman’s face became placid, his countenance as Lebanon! He hopefully passed the strait gate, and found joy and peace in believing. But I feel something like Solomon, when he declared of making many books there is no end. So it is in relating interesting anecdotes growing out of extra efforts. A very few more must suffice. In the winter of 1844, I was engaged with the church in Palmyra—that beautiful village, and interesting field of labor. A short time before closing our effort, I recognized in my congregation a dear brother in company, apparently, with a gentleman I did not know. When the meeting was out for the afternoon, I was met by Bro. J. M. French, with whom I had been in intimacy long before he was converted. His house was often my resting place, where everything that his large heart could suggest, and his liberal hand supply, was always at my service. He had formerly lived on the Big Flats in the Chemung valley, but had been converted in the city of Rochester. He introduced to me, Dea. Barton. They very soon made their errand known. They had come after me to hold a meeting with the Second Baptist church, Rochester. They were commissioned to take me or my pledge, as soon as the meeting closed in that place. I felt very much exhausted, as that was the fourth meeting that I had labored through without rest, except the little respite I had in traveling from one place to another. I would gladly have plead off, on the ground of my worn-down physical system, but they smilingly said, judging from the sermon they had heard, they would be willing to risk the physical weakness! We had a little conference together, when they gave me an account of their condition as a people, stated what difficulties it appeared to them we should have to surmount, and then said much in relation to the favorable circumstances that presented themselves. When I arrived in the city, I went to the church in the evening. They had been worshiping in the basement, where we found a number of brethren and sisters, praying. Things appeared to look favorable. I had an introduction to a few deacons and brethren. Dea. Smith—that eminent man of God, who some few years ago was removed from our fellowship as a church to the fellowship of saints and angels in the upper sanctuary—remarked, "Had we not better go up into the audience room for preaching, to-night?" I replied, "No, my brother, let us labor here until God says, Come up higher." An evening or two after, before it was time to open the services, Dea. Smith said, "Now, what shall we do? The basement is full, and the sexton informs me that there is a crowd outside that cannot get in" I remarked, "This is the voice of God saying to us, Go up a little higher." So we repaired to the audience room above. We had a very blessed time. Week after week, salvation’s streams were full banks. My dear brother, the pastor, baptized, I think, as the avails of the meeting, over seventy. I shall never forget the love of Christ that so richly abounded in the hearts of the brethren and sisters, and the hallowed influence that appeared to rest upon everything around us. Dear Brother Sheardown,--Will you do me the favor to accept the accompanying volumes, as a slight tribute of respect and esteem. They may serve occasionally to revive the recollections of those sweet and hallowed scenes through which we have passed together, while ministering at the altar of God. Confident I am that they will live in my memory as illuminated and sunny spots on the checkered canvas of my life. And I live in the animating hope that we may be permitted to recount these seasons together on the fair fields of final rest. Wherever you may be called in providence, you will have my warmest Christian regards. Our brief acquaintance has won for yourself the truest and strongest affection of which my nature is capable. Bro. Hotchkiss afterwards was chosen a Professor in the University of Rochester, and is now serving, a second time, as pastor of a church in Buffalo. Since the time referred to, I have enjoyed a great many good seasons with the Baptists in Rochester. Although some have gone to their rest who labored so faithfully together, yet there remain many dear brethren and sister, who have a warm place in my heart, but whom I never expect to see again until we meet on the other side of the river. I have become like Jacob of old, well stricken in years, and leaning on the top of my staff. But it is a pleasing thought that there is no old age in Heaven. The great and all-absorbing question is, What can we do that shall most glorify God while we remain on the earth? I have very lately returned from almost the vestibule of the upper sanctuary, and this may be my final adieu to my friends in that city. One Sabbath afternoon, while holding a protracted meeting in a village in Steuben county, we had to give up the school house where we held services, on account of its having been pre-engaged by a minister of another denomination. A Presbyterian friend called at my stopping place to know if I would speak in a tavern, providing it could be obtained. I replied, "Yes, to be sure—I had rather preach than lie still, and I do not know that there is any place on God’s footstool where the Gospel may not be preached." He said, "At what time shall we make the appointment?" I said, "At two o’clock." He remarked, "You need not fear but you will have a congregation." At the appointed time, I found the corner room of the tavern crowded. My stand was near the door, between the bar-room and dining room, the bar directly at my right hand. Before announcing a text, I said, "I can not preach, unless I first ask a question. It has been asked perhaps thousands of times on the very board on which I stand. The question is, ‘What shall we drink?’" The landlord, who was sitting a short distance from me, dropped his head. I continued, "You will find my text in Exodus 15th chapter, last clause of 24th verse: "What shall we drink?" I saw no immediate effect from my sermon. A year or two afterward, while traveling some distance from that place, I met a man on horse-back, to whom I bowed. He said, "Good morning, Elder." I remarked, "I know your countenance, but your name I can not call. "—"Do you not," said he, "remember pulling down my sign-post?" I replied, "No, sir, I do not remember having done such a thing. "—"Do you not remember preaching in my bar-room, and asking the question, What shall we drink?" The reply was, "O yes, I do not mean to forget that; but I did not know that I had pulled down your sign. "—"You did, sir,--for I never had any rest in my soul until I got out of the business. I sold my property, at a loss of six hundred dollars, in order to get clear of the concern. During protracted and other meetings, it is very common to hear prayers for the salvation of a whole neighborhood, or village, or city. But I have never known such prayers answered. And I think the better way is to single out individuals—go to them, alone, and talk about the interests of their souls. Yet it becomes us to be sure that our way is clear, lest we receive the rebuke, "Physician, heal thyself." Never undertake the work, unless your own hear is imbued with the spirit of Jesus. Personal labor must be done by the private members of the church. The pastor, or evangelist, can not do it all. Every individual must do his or her own duty. It is a fearful thing to deal with the souls of immortal beings. If we err, the error may be a fatal one. I have on my mind a circumstance that took place during a protracted meeting in a rural district in ____ county. While passing through the congregation, conversing with different persons on the great subject of salvation of the soul, I met a lady, a school-teacher by calling, apparently twenty-five years of age, of manifest intelligence. I said a word or two to her about he Saviour, and passed on. One of the brethren said, "Elder, what did you make out of that young lady? "—"Not much," I replied—"Nor never will," a deacon remarked. "Did you not know, Elder, that she has sinned away her day of grace, and can never be saved?" I replied, "No, sir, I do not. And by what authority have you come to that conclusion? "—"It is very generally believed, by professors in this place, that it is so. Moreover, while she was attending a meeting of another denomination in the village, the ministers told her to her face that she had sinned against the Holy Ghost, and there was no mercy for her." This representation made me feel intensely, and I determined to make every effort in my power to do her good. The first opportunity I had to converse with her, I learned that she had been raised under the influence of infidelity, but was not herself an infidel. I tried to point her to the Saviour. She replied, "It is of no use, now. I am already lost—Christians tell me so." I asked, "Do you ever pray?"—"No. "—"Did your ever pray? "—"Yes, some time ago—but I can not pray, now." On subsequent interviews, her mind appeared to have grown more dark, and her countenance was more sad. At length, I asked, "Would you like to be saved? "—"Yes, but it is impossible." Said I, "Permit me to ask you if you have a room by yourself, where you board?" She replied, she had. "Now," I continued, "I shall not ask you to pray because you have told me you can not. But I expect to retire to my room, about ten o’clock this evening—and I request you to retire to yours, about the same hour—put out your light—kneel by your bedside—do not pray, but remember, every moment, that Eld. Sheardown is praying for you. Remain on your knees half an hour—I shall close my prayer about half past ten. The next evening, I met her in the church, and asked her if she had complied with my request. She said she had. "Will you do the same duty to-night?" Her answer was, "I will. "—"How long do you wish I should pray? "—"Until midnight," was her reply. I remarked, "Do not pray for yourself until you seem forced to do it." The day following, she informed me she had redeemed her pledge, and I inquired what were her thoughts while alone upon her knees? She replied, "I never felt so in my life." Before parting at evening, I inquired, "Do you wish me to pray again for you to-night?" She replied, "Yes, sir"—"How long shall I pray"—"All night, sir." Her tears began to flow. The Lord was pleased to encourage my faith by giving a little sight. I said, "Will you pray for yourself, to-night?" The reply was, "Yes." Near two o’clock, the next morning, the blessed Spirit came down like Peter’s sheet, and our prayers were taken up to heaven. I felt assured the good work was done. During the day, she attended the meeting, evidently rejoicing in the salvation of God. This is an extreme case. I do not give it as a sample of the moral labor to be performed by brethren and sisters. Yet there are many case quite as difficult, in every field. I have known men so steeped in sin that I feared lest God in His wrath should suddenly take them away in all their guilt. For such individuals, I have often spoken privately to some faithful Christian, giving them (if they did not already know) the particulars of their case—and, if circumstances demanded it, have appointed a continuous secret prayer meeting, day and night, wherein the time was so divided that vocal or ejaculatory prayer should not cease to ascend until it please God to manifest His justice or His grace. This method prevailed in the case of Mr. _____. He had been an infidel of high order—yet, even after his infidelity had given up the ghost, and he was invited to take the anxious seat, he declared, again and again, "Put hell on my right hand, and an anxious seat on my left, and I will jump into hell in preference to going to an anxious seat." But he did enter an anxious seat—was converted to God—and has long been a shining light in Zion. It has always seemed to me that singing is a sublime part of public worship. But adaptation in singing, is just as essential as in preaching. In protracted meetings, I generally dispensed with the formalities of choirs. Guided in a great measure by circumstances, I could not mark out a path in which I should always walk. On Sabbaths, I often desired the choirs, as such, to be in their place—and, sometimes, felt it duty to secure their assistance, if possible, during every meeting. By way of illustration, I will describe a scene that is irrevocably impressed on my memory. While attending a session of the Canister River Association, in a beautiful village in Allegheny county, New York, the little church seemed desirous I should tarry, and hold a meeting with them. They had a large, well-trained choir, and I remarked to a brother, "You have a lovely group of singers. "—"Yes—but they are unconverted." My heart was moved for them. Before the Association was dismissed, notice was given that the church would, that evening, commence a series of meetings, to continue so long as it appeared to be duty. I said, "It seems that I am to remain here, to proclaim unto you the way of life and salvation. Now, I have one request to make of some dear friends, and I hope they will not deny me. I desire that part, if not all of the choir, will be with us, every meeting. I have been perfectly delighted with the execution of the pieces performed during the Association. You are so good judges, that I will give you the privilege of making your own selections, whenever you wish." I believe they made every effort to be present. There were three young men who appeared to be able to lead the choir. The singers became very much interested, and one young lady professed conversion. One afternoon, I preached on the Judgment. When the sermon closed, one of the leaders announced the "Judgment Anthem." He sounded—but, in taking the pitch, he struck as far from it as Old Windham is from Coronation. He tried again, but failed, and took his seat. Another leader made an attempt, but he also failed utterly. Then, the order in the gallery was, heads down—except the young female convert, who remained firm on her feet, her countenance as placid as the waters of the Siloam! Looking at them through my tears, I was forced to exclaim, "No wonder you could not sing, with the dread realities of the Judgment, like drops of boiling lightning, scalding your guilty consciences! Now, dear friends, you need the balm of life. We invite you all to come down, and take those seats, which we will vacate for you. Then kneel, and pray for yourselves—and Christians will pray for you." During this time, the converted lady was passing through the gallery, conversing. I continued, "Now, all of you, come down." She added, "Follow me!" and the gallery was evacuated—the congregation singing. "Come, ye sinners, poor and needy." Nearly all that group of young persons, as I hope, received the pardoning grace of God. "My drowsy powers, why sleep ye so?" " Oh for a closer walk with God!" &c.
"Hearts of stone, relent! Relent!" "Sinners, can you hate the Saviour?" "To-day the Saviour Calls" &c.
"O how happy are they"
" In all my Lord’s appointed ways"
"Come, happy souls, adore the Lamb." "Christians, if your hearts be warm." "O, Lord! And will thy pardoning love"
"From whence doth this union arise" &c.
"Am I a soldier of the cross?" "When I can read my title clear." "Our hearts by love together knit." &c.
"Amen! Amen! My soul replies"
as the meeting was dismissed, a gentleman of high standing in the community was most powerfully convicted. Before he had passed ten rods from the meeting-house, he said to a brother on the road, "Do pray for me!" The brother replied, "Let us kneel down." They knelt together, on the snow, in the midst of the dispersing congregation, and, while prayer was offered up in his behalf, he passed the strait gate, as I trust. It is very desirable that evangelists, and all who conduct prayer and conference meetings, should have their memory sell stored with appropriate hymns and tunes. If they wish to give out a hymn of five or six verses, it should be sung at intervals. "All hail the power of Jesus’ name"
in the tune Mear. We should "sing with the spirit and the understanding also. "..